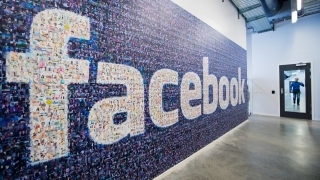 File image -- A big logo created from pictures of Facebook users worldwide is pictured in the company's Data Center, its first outside the U.S., on November 7, 2013, in Lulea, in Swedish Lapland. Facebook is about to sign the biggest lease of the year in San Francisco. The social media giant is expected to take up Park Tower — a 43-story, 750,000 square-foot tower at 250 Howard St, according to authorized sources that spoke to the SF Chronicle. Facebook’s current headquarters stands in Menlo Park, but in recent years, it has expanded to offices in other parts of the Silicon Valley like Fremont, Mountain View, Sunnyvale and San Francisco. According to the SF Chronicle, many young techies are leaning toward San Francisco for its nightlife and culture. So, companies like Cisco, LinkedIn and Facebook have opened up offices in the city to up the completion for employees. "Our whole city is turning into a tech central magnet," said Jesse Gundersheim, a CoStar market economist. The amenities and location of Park Tower don’t come cheap, Gundersheim said the average asking rent in the south Financial District is just under $70 per square foot a year, the Chronicle reported. "The companies that are willing to (have offices) there are going to pay some premium rates," he said.